READ IMPORTANT INFORMATION ON ISLAND PEAK Island peak is a strenuous climb to it’s summit above 20,000 feet and needs to be treated with respect. This challenge will make you felt like you can climb the world and standing on a tiny summit high in the Himalaya’s is a very special feeling, but you need to come trained and prepared for the climb. 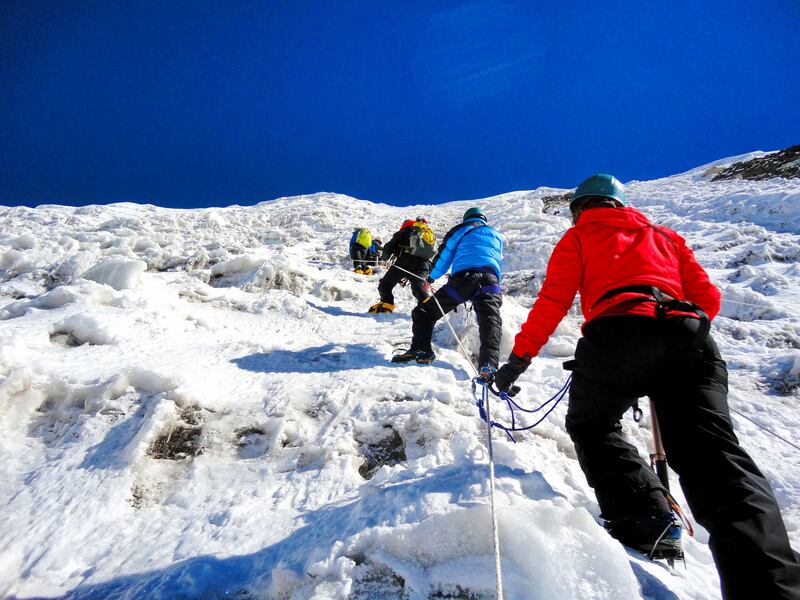 Island Peak is an excellent introduction to Himalayan high altitude mountaineering, but you need to come prepared for this climbing challenge. 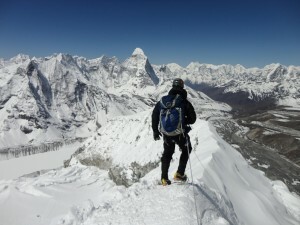 Island peak can be used as a stepping stone to higher peaks. 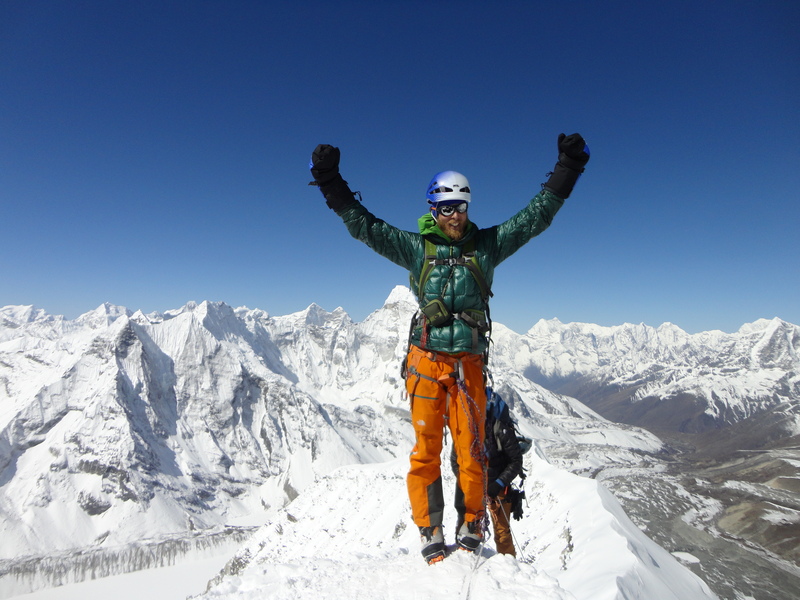 Check out our top 10 tips for climbing Island peak. 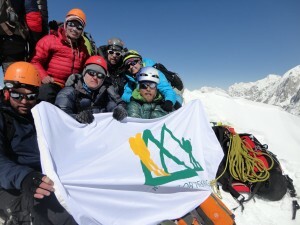 Here is a LINK that gives you so much more information about our Island peak climbs. The approach to the Imja Valley starts on the traditional Everest trail following from Lukla to Dingbouche, where the trail then veers off towards Chuckung, and where you have your last night stay before entering the Imja wilderness. 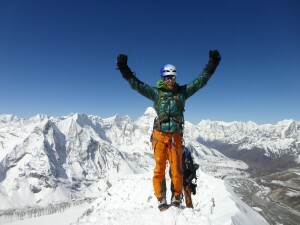 We run 3 different itineraries for climbing Island peak. 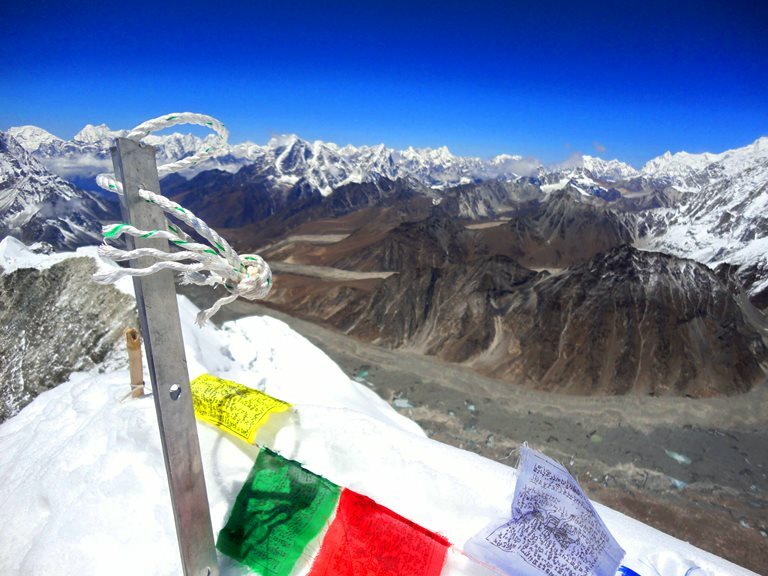 Our most popular route includes Everest Base Camp. This amazing trek leads you through breathtaking views of the peaceful valley. Our climbs are different. We spend two night at Island peak base camp 5,100m/ 16,733 ft. along with an additional night at high camp 5,500m/ 18,045 ft. giving our teams the best chance of climbing Island peak. We also have three nights in Namche Bazaar, giving you the best itinerary for your Island peak climb. Check out our reviews. As you walk towards base camp, you can see the whole of the Nuptse Wall which leads into Lhotse (the fourth highest mountain in the world), which Island Peak extends from, and you will see that it truly is an island peak. It is surrounded by a sea of glaciers and moraines pouring down from seven and eight thousand meter giants. We recommend this trip to people who want to go to the Everest Region, but also want more of a challenge and have mountaineering experience. 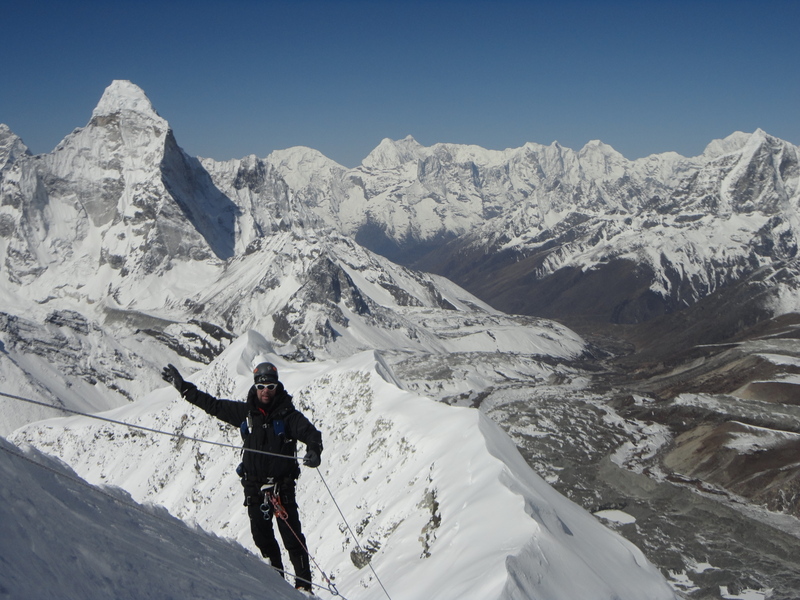 We can add in the climb of Island Peak to your Everest Base Camp trek, offering you the chance to see the amazing Everest Region as well as trying your luck at a stunning 6,189m/ 20,305ft peak. This trip is for the person looking for a more adventurous wilderness experience in the Himalayas and definitely will be the trip of a lifetime! Our prices start from $4,200. We are always happy to talk training, clothing and equipment and answer all your questions. Leave home for Kathmandu, aiming to be there by Saturday at the latest. In Kathmandu, we will stay in the Thamel district, positioned well in the city center. You can arrive early and do a half day trip around Kathmandu to some cultural sights and get all remaining necessary items for the trip. We will make an early morning start for the Twin Otter flight to Lukla 2,840m/ 9,317ft, the gateway to the Khumbu. This is an exciting flight, which should give a glimpse of Everest in the distance. In Lukla, we will meet our trek staff and porters and set off straightaway for our first night’s stop at Phakding. Situated on the banks of the Dudh Kosi, which drains the whole of the Khumbu Region, this small hamlet is on the main trade route through the area and there are a number of clean, well-built lodges where we will spend the night. We will continue up the banks of the Dudh Kosi, crossing it twice by small suspension bridges before reaching the village of Monjo, where we will enter the Khumbu National Park. We will then cross the confluence of the Dudh Kosi and the Bhote Kosi on a high suspension bridge and then climb steeply for about two hours up ‘Namche Hill’ to reach Namche Bazaar 3,440m/ 11,286ft. This is a prosperous trading town and the capital of the Khumbu Region. Many Tibetans cross the nearby border to trade their wares and the local market is a fascinating spectacle. This is a good place to buy genuine Tibetan artifacts. Just across the valley to the east stand the peaks of Thamserku and Kangtega, both very impressive mountains. We will spend three nights here giving you excellent acclimatization. We will spend three nights in Namche Bazaar. During this critical acclimatization phase, we will spend time resting and trekking to higher altitudes. This will allow our bodies to become acclimatised to the altitude of 3,440m/ 11,286ft. On the first morning, we will trek up to Shangbouche Hill 3,900m/ 12792ft with one of the great panoramic views of the Everest region, returning to Namche for lunch. The afternoon can be spent sampling the delights of the Namche bakery or Cafe Danfe, the famous Everest t-shirt bar. 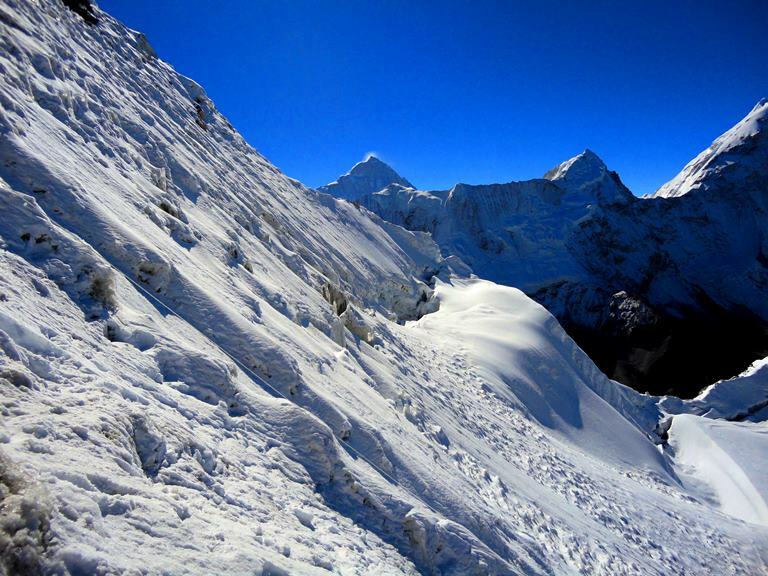 From Namche, the well-worn Everest trail contours around the side of the valley, high above the Dudh Kosi. As we follow the path, we will get our first really good views of the great peaks of the Khumbu: Everest, Lhotse, Nuptse and Ama Dablam. Passing by several villages and numerous tea shops, we will cross the Dudh Kosi River and make a steep climb to Tengboche, home of an impressive and recently rebuilt monastery. We have plenty of time to look around Tengboche 3,900m/ 12,795ft (and have a cake at the bakery! ), but at the height of the season it is a busy place, so we may drop down to the river and the village of Deboche 3,700m/ 12,135ft a little further along the trail, where we will stay in a relaxing lodge. Shaded by rhododendron trees, the trail crosses an airy suspension bridge just beyond Deboche. An hour’s walking from here will bring us to Pangboche, an excellent viewpoint for Ama Dablam (‘Mother’s Charm Box’) and home for the Sherpa’s who work on this imposing mountain each post-monsoon season. Contouring up the valley side, we will re-cross the river and turn up the Imja Valley to reach the picturesque farming village of Dingboche 4,410m/ 14,465ft. Dingboche is a good location for acclimatisation, prior to our ascent up the upper section of the Imja Valley. While in Dingboche, we will acclimatise up to 4,900m/ 16,076ft and also attend a seminar about high altitude acclimatisation at the hospital in nearby Pheriche, run by the Himalayan Rescue Association. The walk over to Pheriche and back will also serve as good acclimatisation training and so make the walk doubly worthwhile. We will take a stroll to the other side of the Imja Valley and cut across to the Northern side of Ama Dablam to get close up to one of the most impressive Himalayan greats. With amazing lakes and stunning glaciers this is a day not to be missed, then head back to Dingbouche. We take a long walk above the valley where Pheriche is positioned, with stunning views all around, a nice stroll gradually up hill to Dugla and our lunch stop. The trail from Dugla starts steeply to climb up beside the glacier moraine. After a few hours the track eventually leads to a small cluster of tea houses pleasantly situated at Lobuche 4,940m/16,207ft. We will spend the afternoon relaxing and continuing the process of slow acclimatisation. About three hours beyond Lobuche, we reach Gorak Shep 5,180m/ 16,995ft, the site of the 1953 Everest expedition’s base camp. 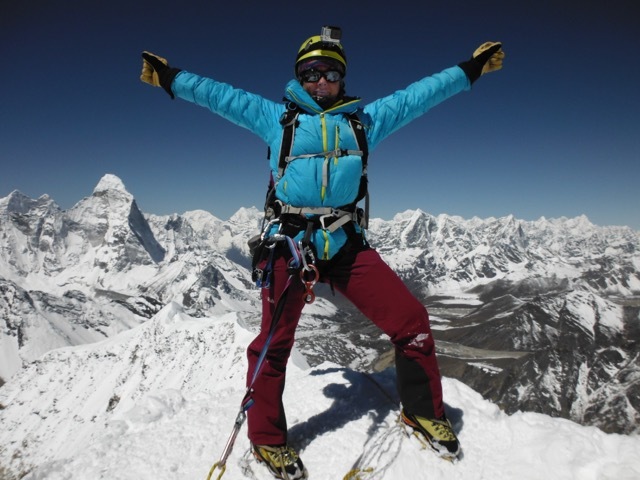 We visit base camp and climb Kala Pattar using Gorak Shep as our base. The views from Kala Pattar are often clearer in the morning, though the position of the sun means that photos are often better taken in the evening. 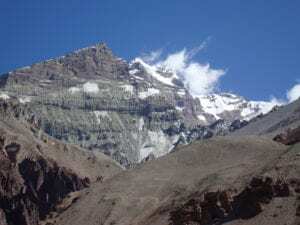 This decision will be make at Gorak Shep, we can decide when we would like to climb Kala Pattar and on which day we would prefer to trek into base camp. When we go to Everest Base Camp we will go to the edge of the Icefall, meet some teams preparing for Everest, pack up and head back to Gorak Shep to sleep. In the morning we will make an ascent of Kala Pattar 5,642m/ 18,510ft, if we have not already climbed it the previous evening. 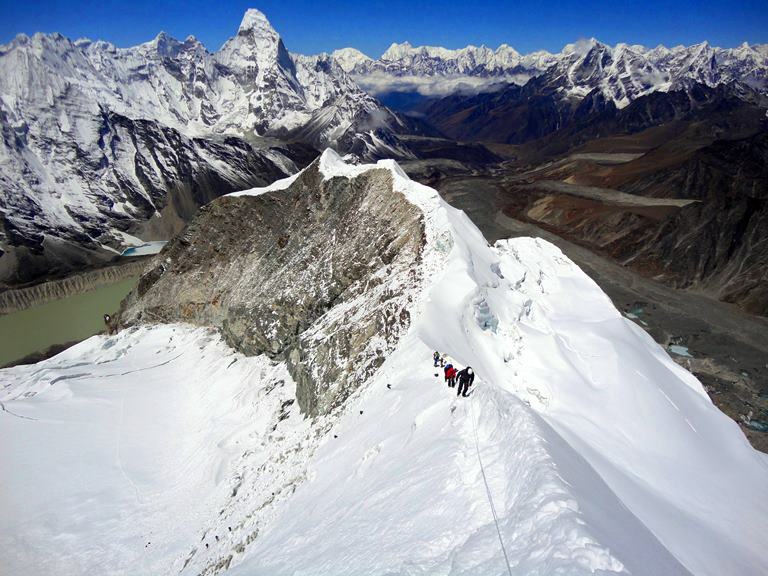 The climb takes between 2 and 3 hours and is hard work, but the effort is rewarded by the classic view of Everest and the Khumbu Icefall, as well as Lhotse, Nuptse, and Pumori immediately above. For most trekking teams, this is as far as they go up the Everest trail. We return to the lodge at Gorak Shep for breakfast. After breakfast, we will descend the valley to Dingbouche at 4,410m/ 14,465ft. After an early breakfast, We will say goodbye to our Everest base camp friend and from Dingboche, we will hike up to Chuckung at 4,700m/ 15,420ft. After arriving we will have lunch and then get all climbing equipment sorted. Weather depending we will do our first training session. We will practice abseiling, Jumaring and get used to your climbing equipment. We will rest up and get a good nights sleep. We will take our time this morning, packing up all gear load them to the yaks. We may do some ladder crossing training before heading off to Island Peak Base Camp. 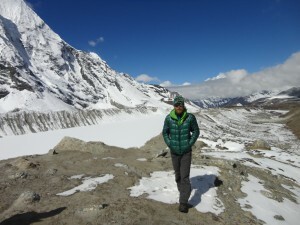 Depending on how long this takes, we may have an early lunch in Chuckung before heading towards Island peak base camp. The hike up to Island peak base will take 3 to 4 hours. There is an amazing glacier and lake with more stunning views of the Imja valley. 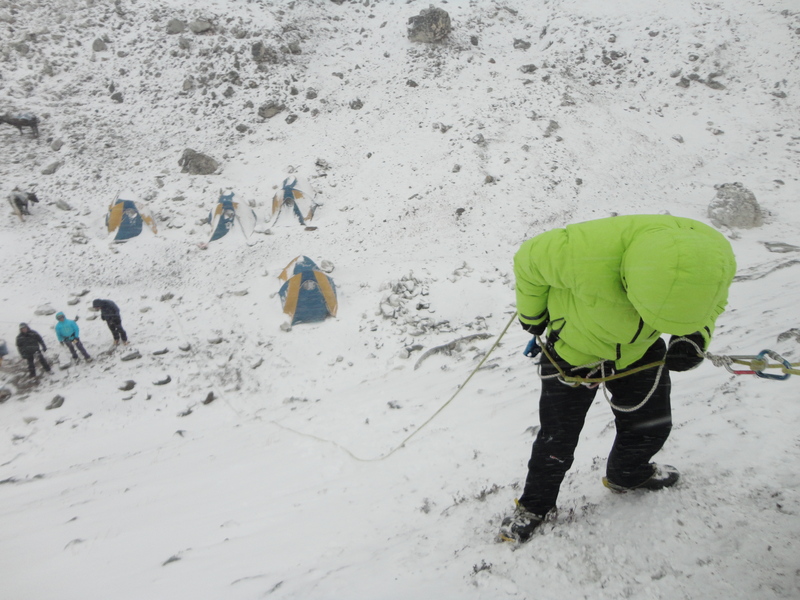 We will have a rest day in Island peak base camp, where we will do some extra training. We will set up a rope system for you and give training for jumaring on steep terrain, and spend hours abseiling and making sure you are comfortable with your climbing equipment and using ropes. We will also do a final gear check. We will sleep a second night in Island peak base camp. After breakfast we will pack up our gear and tents so it can be transported to Island peak high camp. We will rest in the morning and re-hydrate, stock up on more water and after an early lunch and make the 2 hour hike up to Island peak high camp at 5,500m/ 18,045ft It is important to rest, sleep, drink plenty of water and get your gear ready for going to the summit in 12 hours time. Today we will make our summit attempt on Island Peak 6,189m/ 20,305ft, however, this may be delayed due to weather conditions. This is a long hard climb; initially there is a steep 400m/1,312ft zig-zag rocky scree path with some scrambling, before a scramble and traverse across to a steeper section of rock. This is straight forward trekking, but very strenuous and once you hit 5,900m/ 19,357ft the altitude slows the pace dramatically and the final rock section never seems to end, but once you dig deep, we top out onto a narrow ridge which takes us to the start of the glacier. 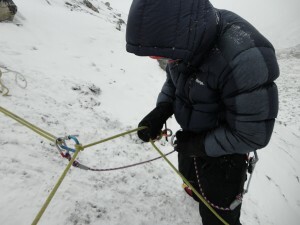 We get all our gear on, rope up and cross the glacier before the 100m/ 328ft head wall which is fixed by our climbing Sherpa’s, before the tricky final section to the summit. 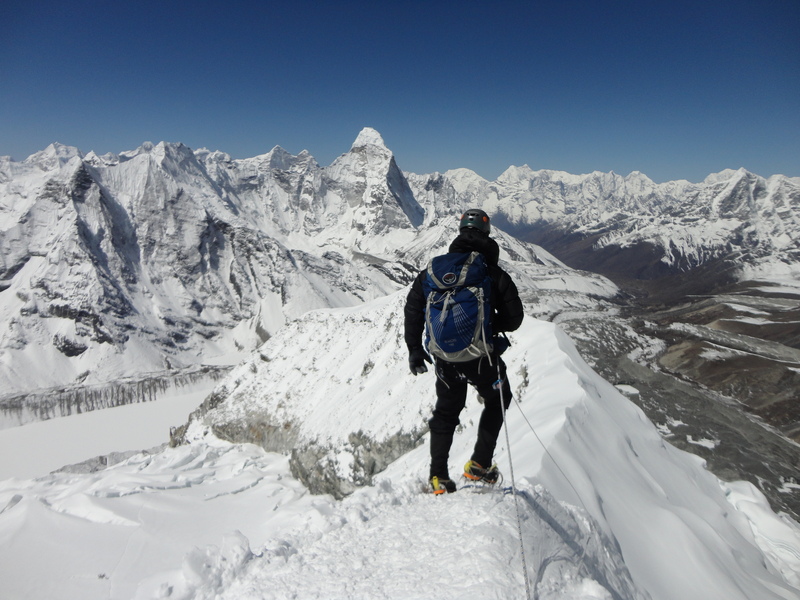 After we enjoy our summit success, we begin the long decent back to Island Peak high camp. We will rest for an hour or so before making the journey all the way back to Chuckung. Trek to Tengbouche at 3,900m/ 12,795ft This hike will take about 4 to 5 hours. We will aim to arrive for Lunch or maybe a little later. You can visit the bakery or the famous Tengbouche monastery. You will be tired so after an early dinner you will hit the hay. As we will be up early for the hike back to Namche Bazaar. Trek to Namche Bazaar. After breakfast we will start walking at 8am or 9 am and trek back to Namche. This hike will take 4 hours. We will be back below 3,500m/ 11,483ft and you will feel much better and possibly the time to enjoy a beverage at cafe danfe and celebrate, but not too much as we have a long walk back to Lukla the following morning. After a night of celebration in Namche Bazaar we will make the long journey back to Lukla. We will cross the high suspension bridge from the Everest movie and then many others along the 7/8 hour journey back to Lukla. We stop for a break in Jorsalle and continue onto Phakding for lunch and then make the 3 hour journey back to Lukla and that will be job done. We will be up for an early breakfast and the flight from lukla back to Kathmandu. For those eager to see as much of Kathmandu as possible, an early start is worthwhile. You can visit the temples of Pashupatinath and Swayambhunath and districts of Bhaktapur and Patan Durbar Square should also be on your essential to see list while in Kathmandu. There is also plenty of shopping to be done in the Thamel. After a nice day of resting, shopping or spa treatments in Kathmandu you will be transferred back to the airport for your international flight. Does this information excite you to take the next step towards achieving your goal of climbing Island peak? If so, get in touch today. We pride ourselves on making sure that our clients have every opportunity to succeed on the mountains, including professional training advice, gear lists and video links on how to pack your bag, and much more. We are always available to answer any questions you may have by email, phone or skype, so contact us today!